NAMM 2019: Charvel has a rich history of collaborating on signature models with its artists, from Gojira’s Joe Duplantier to Guthrie Govan. For 2019 an all-new Charvel artist model and a dazzling new finish for an existing model are heading your way. The Angel Vivaldi Signature DK24-7 NOVA 7-string has been designed in partnership with the American prog genius. 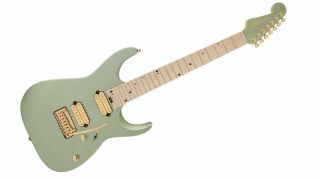 The guitar features a modified Dinky basswood body with sculpted heel, styled out with an eye-catching Satin Sage Green finish with gold hardware and a tilt-back reverse 7-string licensed Fender Stratocaster headstock. The three-piece bolt-on maple neck comes complete with graphite reinforcement and a smooth hand-rubbed oil back finish, Luminlay side dots and a heel-mount truss rod adjustment wheel. A 12”-16” compound radius maple fingerboard features rolled edges for added comfort, plus 24 jumbo frets, cascading black dot inlays and Graph Tech TUSQ XL nut. The HH pickup configuration, consisting of a DiMarzio The Tone Zone bridge pickup and DiMarzio Air Norton neck pickup, is designed to deliver deep, full tones. Other premium modern features include a five-way blade pickup switch, dome-style knobs for the volume and tone controls, Gotoh Custom 7-string 510 tremolo bridge, locking tuners, and more. All this will set you back £1,139. In other Charvel Signature model news, the Signature Pro-Mod DK from Steel Panther’s spandex shredder Satchel is now available in a bonkers Slime Green Bengal finish. If you want to own this slice of flamboyant fluoro magic you can expect to pay £1,249. For more on these guitars visit Charvel.